Do any of you remember what it was like buying from TCGplayer before TCGplayer Direct? How about selling on TCGplayer before then? It was a little different, a little weird and a little sub-optimal, though we didn’t know that at the time. All we knew was that when TCGplayer Direct came along, things were going to be different. Now, all of a sudden, when we ordered a whole deck worth of cards or bought a significant number of copies of a card for a spec from multiple sellers, we started getting one package. Sellers would send the cards they wanted to sell in to TCGplayer and TCGplayer would package the cards and send them to buyers, eliminating the need for four sellers to make up four packages to go to one person who would receive those four packages. This is known as “stream-lining” (I mean, I assume, I’ve never taken a Business course in my life) and, like in non-metaphorical streamlining, it reduces drag. We can agree, then, that TCGplayer has a little bit of experience streamlining the buying and selling process. They have created a marketplace where people who aren’t gigantic stores but rather are individuals trying to get rid of some cardboard can participate. It’s the eBay model but tailored specifically for our specific game. It’s been working pretty well so far. 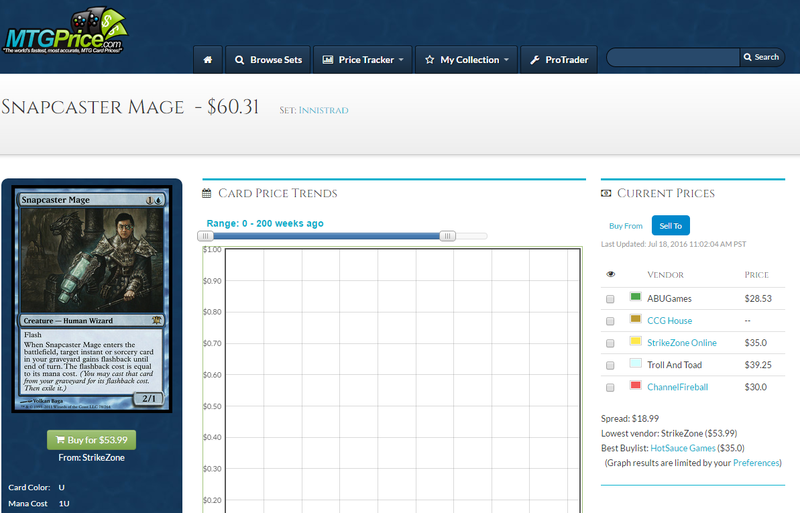 The TCGPlayer marketplace is often a go-to for buying cards, and is often referenced as the going price of a card. So now that we’re all caught up, do you remember how TCGplayer Direct changed things? Because it’s about to happen again. In the exact same way that TCGplayer Direct changed the way people bought and sold cards on TCGplayer, TCGplayer Direct buylist is going to change the way people, wait for it, buylist. That is, to say, it’s going to change the way some people buylist, or sell their cards to stores. I think there are a lot of advantages to this method, but I also think this is likely to be a supplement for a lot of us rather than a complete sea change to how we do business. This does have one distinct advantage over all of the methods I currently use, and that is convenience. The first buylisting I ever did involved bidwicket.com. If you’ve never been to bidwicket, it’s a confusing place. Once you figure out how to navigate it, though, it ends up being worth it – at least it used to before there were alternatives. Bidwicket was useful because it had a lot of buylists from vendors accessible. You would type in the name of a card and it would take you to this page. You could click the “sell to store” link down where it lists the buylist prices. You filled up a “shopping cart” for each vendor, and when you finished and checked out, you would process the order separately for each vendor. You would mail the cards to the vendor and the vendor would pay you. Usually. That’s another story, and it’s not really bidwicket’s fault. The point is, this worked fine. A lot of the times, the online price was better than the in-person price and I found myself using bidwicket a lot in between Grands Prix. It wasn’t fast or particularly convenient, but at the time, it seemed worthwhile. Then websites began to take the next step, with MTGPrice and others developing ways to connect sellers to stores that want to buy their cards. The big revelation here is allowing you to search both the retail price as well as the buylist price and the website taking you to each dealer’s webpage. These services all work with the goal of not forcing you to go to each dealer’s web site and punch in the card five times. With some offering the ability to fill your cart once and then have that list populated to vendors’ sites, it becomes very easy: you search once, then send them the cards you agreed to sell them (in the order they specify) and you get paid when they get cards. It couldn’t be simpler. Or could it? While convenient, there are some shortcomings with all these services. Selecting condition is one of them, as are bugs or bad links when trying to tie together so many individual web sites. Some stores only accept NM cards but others grade down for condition but would like to be apprised that they’re getting less-than-NM cards. Another issue is that it’s no fun trying to balance getting less money for the cards and paying more money for shipping because you’re sending out a ton of packages. It’s hard to know how to balance that, and when you’re sending the quantity of cards I was sending, a $12 flat-rate USPS box didn’t always cut it, meaning sometimes it cost $24 to add a new vendor. How many times does that vendor paying a nickel more per card add up to cover the additional shipping? Why do I have to choose which way I’m losing a lot of money in non-free transaction costs? It felt pretty bad. So what exactly will TCGPlayer offer in this field? The premise is simple. Much like an account for selling cards on TCGPlayer, there is a level associated with your account for selling cards to TCGPlayer, and as you complete orders and send the cards in you move up. 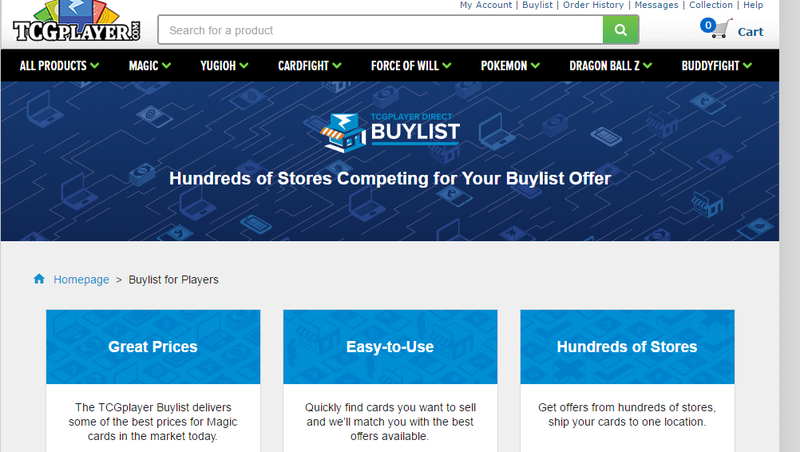 Top stores in the TCGPlayer Direct program will have the opportunity to be part of the buylist program, and it will essentially create a marketplace for buylists similar to what is currently available. Searching for a card will bring up the marketplace with the current highest offers by stores buying the card. There are a few key notes here. Stores pay the fee associated with buying the cards from you. Money is deposited directly to you when the order clears. Because the stores buying from you are part of TCGPlayer Direct, you only ship once. No matter how many stores you’re actually selling to, you only ship to TCGPlayer. One package, one tracking, one insurance – you don’t have to ship to multiple stores. However, by that same token, “stores involved in TCGPlayer Direct” is not everyone. There are plenty of stores with great buylist prices that you’ll find going through MTGPrice or the dealers’ own sites – Card Kingdom and a few others come to mind – that you won’t find on TCGPlayer. I have monkeyed with TCGplayer Direct for a few days and I think it has a few very distinct advantages over both in-person buylisting that doesn’t let you sell cheap cards or large quantities, and online buylist aggregates which all come with their own set of challenges. TCGplayer Direct is very simple. Sellers will go to the TCGplayer website. 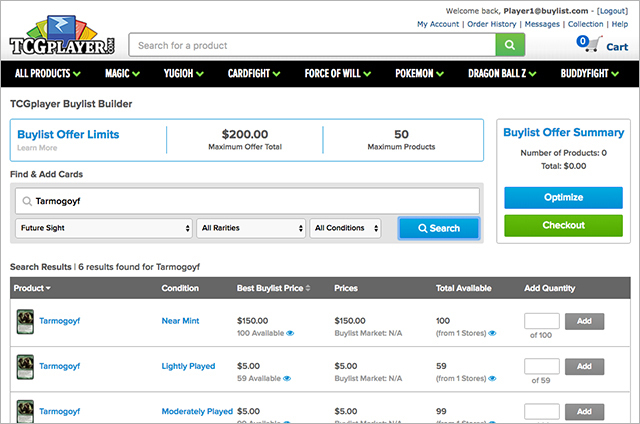 Players used to selling cards on TCGplayer will recognize the seller portal but now there is a new option – buylist. 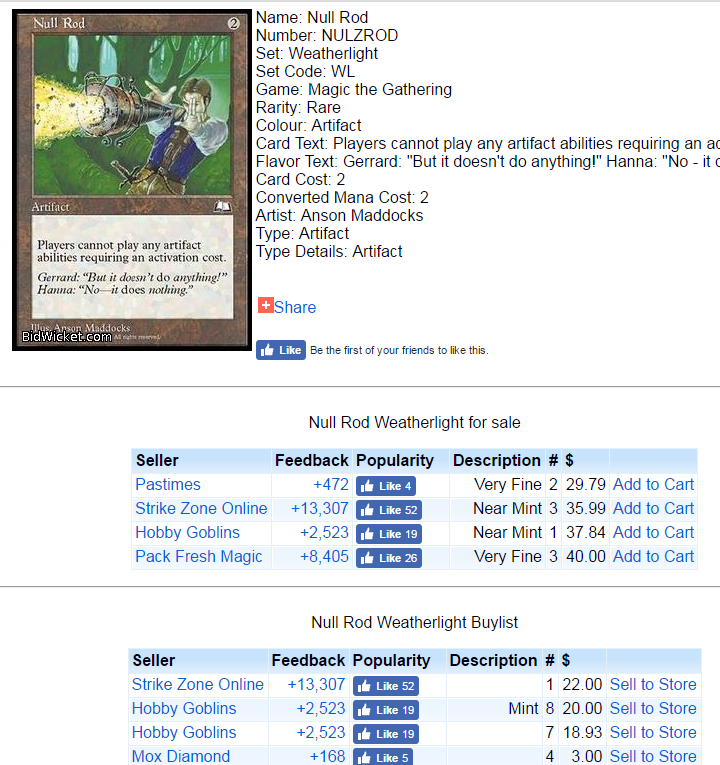 You type in the name of a card, search for it, and it will bring up a list of the vendors buying the card for each condition and for foil and non-foil. You will populate the appropriate field corresponding to the number of copies for each condition and edition you are selling and then you submit the offer. It will tell you how much money is coming to you based on the combination of dealers buying that many copies. If three dealers are paying between $3 and $5 on Night of Souls’ Betrayal and that’s acceptable to you and those two dealers are buying 10 copies total and you want to send that many, put “10” in the field for NM non-foil and submit. You’ll be offered the total of what each dealer is paying for each copy. You’re still splitting 10 copies over multiple dealers only now you aren’t sending in multiple orders. You will drop all 10 copies in the same envelope and send them in to TCGplayer. TCGplayer will verify the order is complete, the conditions are correct and will pay you and give the cards to the dealers. If that sounds complicated, it doesn’t need to be because all you need to know is that you will type in a card, select as many copies as you want to send in and then mail them to TCGplayer and TCGplayer will take care of the rest. Sending one package is incredibly convenient and you will have access to a much larger number of dealers than you ever did with another service. This saves money on shipping costs and packaging, which is not only valuable in itself but also saves you a lot of time on the front end. If you aren’t happy getting $3 for your copies, the list will tell you who is paying the most and how many copies that dealer is buying. Just submit that many copies and get the best price, or submit the max number of copies being asked for and take a combination of all prices. You don’t sacrifice any degree of control over the amount of money you get versus other systems and you get additional convenience in the form of only sending one package. Ultimately, I think this is likely to be a supplement to how I buylist. I still plan to use a combination of the different tools available along with TCGplayer Direct or at least verify that I’m getting the best prices and not losing too much to shipping fees (buyers, not sellers pay all of the fees associated with TCGplayer Direct buylisting so shipping is your only expense as a seller) and I’ll be happy to switch over entirely if TCGPlayer Direct buylisting turns out as good as it looks like it could be. It will only get better for people as more dealers add TCGplayer Direct as an avenue to get more cards sent to them and more dealers means more competition which means higher prices for players selling to them. Having monkeyed around with the site a bit, I found it easy-to-use and very similar to other TCGplayer services and I’m excited to see how many dealers add their buylists in the coming weeks. This has the potential to completely change the way I buylist and I don’t see a ton of downsides. All of my criticisms of it were pretty minor (you have to click the search icon instead of clicking on the card name to get the page to come up) but we’ll have to see how the first few weeks go before we can make final pronouncements. As far as a first look at the site goes, I’m hopeful and I think this could be big news for the community, finance or otherwise. Makes me wonder if buy sell spreads become much more narrow like in MTGO since there may ultimately be that much more competition. It is certainly possible. However, one of MTGO’s advantages is the lack of lag time which I don’t expect to see here. How are you paid then? By Paypal? Looks like you add your bank/routing and are paid like tcgplayer usually does. Intermittent bank transfers once transactions clear. So far the buylist prices seem sort of meh as a seller, but perhaps there aren’t that many participating stores yet. It would be nice if they open up the buylist program to non-direct stores — it isn’t immediately obvious to me why one would need to be a direct seller in order to be a buylist participant — since even after fees I’d rather buy than sell at a lot of these prices. I think there it will be hard to pull many of the casual buylisters in as they take advantage of the store credit bonus offered by store’s websites. The way TCG buylist will really take off is allowing all sellers or maybe just anyone to create a buylist. Maybe you make people purchase buylist tcg credit ahead of time ? Then the existing software can take everyone’s tiny buylists and combine them into useful quantities. Just like there are buyers who want cards quickly and sellers who will wait, there are casual buyers who can wait. I know there are hundreds of cards I would pickup for buylist prices that I just want for cube/edh/collecting/speccing that I am in no rush to buy now. There are many foils I would like. And at the 30-50% discount for a buylist price that would be great.